As the globe turns toward summer on the North American Continent the sun changes the equation for home energy efficiency. The number one way to save energy, money and the environment this summer: Manage The Thermostat. Install a programmable thermostat. These are widely available, inexpensive and easy to install for most homeowners. If you have a second home, go with one of the new wifi models so you can remotely control a distant home. 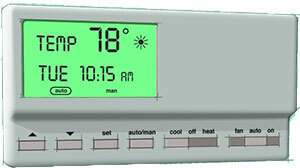 Set or program your thermostat to save by keeping it at or above 78 degrees. Use ceiling fans when in rooms and set thermostat even higher (buy Energy Star rated ceiling fans to save even more on energy.) And turn off the fans when no one is in the room – they cool people not places. Schedule Air Conditioning Maintenance. This can be a DIY project. However, for climates where the A/C unit has been off all winter it may be best to have this done by an HVAC professional. Either way, chances are most homeowners will spend less on HVAC expenses with a clean unit cooling their homes. Keep heat sources away from the thermostat. Lights or other sources of heat near the thermostat will cause the A/C to run more frequently. Seal air leaks. This is just as true for summer cooling as winter heating. Outside air leaking into the home around doors, windows and other areas raises energy bills. Sealing around obvious visual leaks is easy. For a complete assessment have a blower door test done by a qualified professional. Lower the water heater temperature. The warmer summer weather makes people feel warmer (unless their home A/C is set too low!) and allows hot water to stay warmer from the heater to the faucet. Change the water heater thermostat to 120 degrees. There are many more ways to lower cooling bills but these quick fix items will make a big difference in most homes. However, the majority of older homes in the U.S. are under insulated. Retrofitting attics and walls with cellulose insulation is affordable and offers one of the fastest returns on investment for major home energy improvements. Learn more on the CIMA website. This entry was posted in Cellulose Insulation, DIY & Insulation Tips, Energy Savings. Bookmark the permalink.